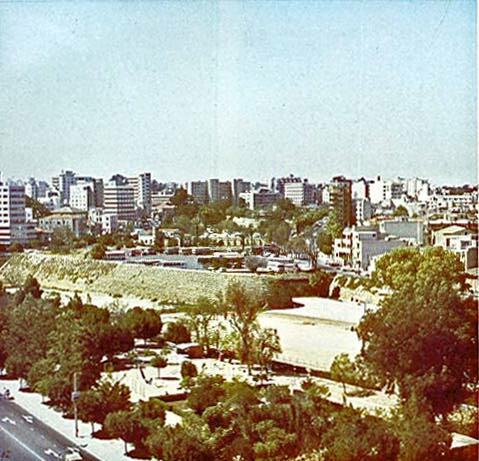 Cyprus is classified into six(6) districts(major cities with their suburbs), according to the constitution of 1960. These major cities are: Nicosia, Limassol, Larnaka, Paphos, Famagusta, Kyrenia. Nicosia, the capital of Cyprus, lies in the north central part of eastern Mediterranean island. Its population is 186,000. It houses the main government offices as well as the headquarters of many major local and international companies. The Presidential Palace is in Nicosia which is a busy commercial centre today. Nicosia is a trading center for the surrounding Mesaoria Plain, where wheat, olives, almonds, and fruits are grown. Light industries manufacture machine tools, textiles, tobacco products, pottery, and leather goods. Tourism is important. Landmarks include the Church of Saint Sophia--now a mosque--which was begun in the 13th century, and the 15th-century Venetian walls, which were constructed by the Venetians to withstand an expected invasion by the Turks(1571). Nicosia is also the archepiscopal seat of the autonomous Church of Cyprus. Known as Ledra in ancient times, it was first mentioned in the 7th century BC. Nicosia was ruled by the Byzantines (330-1191), Lusignan kings (1192-1489), Venetians (1489-1571), Turks (1571-1878), and the British until 1960, when Cyprus became an independent republic. During the Venetian expansion eastward in the 1500's, Nicosia (Lefkosia) was fortified with imposing stone walls and massive gates. The famous Famagusta Gate still stands today, proudly protecting the still ancient town within from the modern city without. Through the Gate lies Laiki Geitonia, an old section which has been lovingly restored. Wend your way through narrow stone streets where crimson flowers cascade from window pots and the aroma of traditional baking wafts through open doorways. Explore jewellery and handicraft shops, dine in charming tavernas, marvel at churches centuries old. Those engrossed in history and art will make their way directly to the Cyprus Museum, which holds the island's priceless treasures from the first stirrings of the Neolithic Age through the Roman period. At the Byzantine Museum, encounter a dazzling collection of early-Christian icons from the Mediterranean's Golden Age. The State Collection of Contemporary Art takes a newer prospective, focusing on Cyprus' modern artists, some of whom have gained note on the international market. Come full circle in time and visit the Cyprus Handicraft Center workshops, where traditional arts are practiced today much the same way they were in ages past. Relax and enjoy a splendid Cypriot meal, accented by one of the island's famous wines. Later, the night life beckons near Famagusta Gate, giving expression to the Cypriot's legendary spirit of celebration. 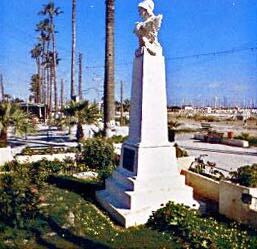 Limassol is the second largest town in Cyprus and has a population of about 143,000. Its history is obscure but it seems to have grown in importance after the decline of the ancient kingdoms of Kourion to the West and Amathus to the East. Today Limassol is a major port, a busy commercial centre, the home of hundreds of offshore companies, and a popular tourist resort. Renowned for its superior hotel accommodation and service, and for its cosmopolitan atmosphere, it has grown out of all recognition over the past ten years. The Limassolians have a reputation for being the most sociable people on the island and the town is the venue for the annual Carnival celebrations and a Wine Festival, held every September. Situated at the heart of the vine-growing district, Limassol is home to the country's main wineries and is an important centre in the production of fruit and vegetables. Small industries also flourish here on the two Industrial Estates located on either side of the town. Visitors are likely to confine themselves to the so-called "Tourist Area" which stretches along the coast road from Amathus to the Old Port, and to the old shopping area around St. Andrew Street, although there is much to be seen outside the town boundaries. Today, the tradition of celebration and hospitality continues in this vibrant seaside town. In February before Lent, masked revelers invade the street with music, parades, and dancing for Carnival. In September, the Wine Festival explodes in the town for a week. And every night people in restaurants, cafes, and nightclubs celebrate events momentous and trivial, from a soccer win to a sudden romance to yet another stunning sunset at day's end. Explore Limassol Castle, which contains the Cyprus Medieval Museum, or the Folk Art Museum, which is housed in an old mansion. Walk on ten miles of beautiful beaches, deservedly known as the Cypriot Riviera. Stroll in the sea promenade or visit the lush Municipal Gardens. On the coastal road to the east, just after the luxurious hotels, you will find Amathus, one of the ancient city Kingdoms of Cyprus. See the ruins and take a dip near the site of an ancient port. At 14 km west of Limassol lies Kolossi Castle, a medieval fortress whose walls contain not only an imposing tower and surrounding living quarters but also an ancient sugar factory. Just 19 km west of town, visit the Kourion archaeological site, an ancient city-kingdom, where you can take in a play or concert at the ancient Greco-Roman Theater, overlooking the blue Mediterranean. And, a bit further on, explore a treasure trove of Greek and Roman sites, such as the Sanctuary of Apollo. Here yachts and sailing vessels from around the globe bob and glint, and along the harbor perimeter is a palm-lined promenade. Between shopping trips to Larnaka's international-caliber boutiques, inviting cafes offer shady resting spots and sweeping ocean views. The promenade winds its way to a striking finale, the Larnaka Medieval Museum, housed in a 17th-century fort. Originally called Kition in the days of the Old Testament, Larnaka reached a heyday as a commercial center in the 1700's, when the consulates were established here. One of the oldest, continually-inhabited cities in the world, Larnaka abounds with sights. Nearby is an 18th-century aqueduct, and two wonderful museums - the Larnaka District Archaeological Museum and the Pierides Foundation Museum. Both contain exceptional examples of Mediterranean art. Make your way north from the fort, toward the center of the city, and you will come to one of Larnaka's and the island's most cherished sites - the church of St. Lazarus.After his resurrection from the dead by Jesus, Lazarus elected to live out his "second" life as Bishop of Cyprus. He is reputedly buried in a crypt under the main altar. Paphos is rapidly becoming the most popular holiday resort in Cyprus. 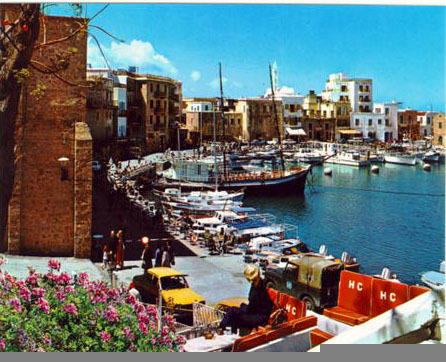 The small, picturesque harbor is a popular meeting/dining place and Paphos is especially interesting for those who care for history and archaeology. The population is about 40,000. The fact that Cyprus' second International Airport is located nearby does not appear to have changed anything about this sleepy coastal town. Close to the waterside restaurants at the harbor lies Paphos Fort. It was built by the Turks in 1592 on the site of an earlier, ruined medieval castle. Inside there are rooms once used as dungeons while the main room is occasionally used for exhibitions. From the roof one has a fine view of the harbor and the surrounding country. Not to be missed Paphos is the House of Ancient God Dionisos. A 3rd Century Roman Villa was discovered in 1962 and is named after one of the mosaics depicting Dionysos, God of Wine. The mosaics are now protected by a wooden structure with walkways which permit visitors to view with ease. Aphrodite's presence seems to have drawn other divinities and notable mortals as well. Excavations have unearthed the spectacular 3rd - 5th century-mosaics of the Houses of Dionysus, Orpheus, and Aion, and the Villa of Theseus - buried for sixteen centuries and yet remarkably intact. Their grace of line and subtlety of color will surely inspire elevated feelings in those who see them. Also in this region is the Odeon Theater, a stone structure still used as it was in ancient times for outdoor concerts, plays, and games. Small wonder then that the whole town of Paphos is included in the official UNESCO list of cultural and natural treasures of world heritage. Past Polis and Latsi, the Baths of Aphrodite provided the ancients with a dramatic setting for outdoor bathing. The Fontana Amorosa, or fountain of Love, still bubbles forth nearby. Is it simply water... or Aphrodite's fabled love potion? Later periods of history have also left their traces. The tombs of the kings, in Kato Paphos, is a monumental honeycomb structure carved into sheer rock whose vaults held the tombs of Ptolemy period nobles. Nearby, the stone pillar where St. Paul, according to tradition, was bound and beaten for preaching Christianity thrusts heavenward. The Chrysorrogiatissa Monastery was founded in the 12th century A.D. and is dedicated to "Our Lady of the Golden Pomegranate". The neighboring monastery of Agios Neofytos contains some of the world's finest Byzantine frescoes and icons as well as an interesting Byzantine museum. Archaeological discoveries in the Paphos region are continual, making it a highlight for those tracing civilization's roots in Cyprus. For a glimpse of the artifacts and master works found in the area, visit the District Archaeological Museum. Returning to the 20th century, enjoy a cool drink, a steaming Cypriot coffee, or a meal of just-caught seafood in one of the tavernas that dot the scenic harbor side in the town of Paphos. Hotels for every taste and budget can be bound in town and the surrounding area. Use them as your home base for discovering this rich region. OF THE TURKISH TROOPS IN 1974!!! The central point of old Famagusta is the magnificent Latin cathedral of St Nicholas, consecrated in 1326. Thanks to its later conversion to use as the Lala Mustapha mosque, the building has not only remained standing where many minor churches have been allowed to fall into decay, but it has escaped many of the architectural modifications which have been made to contemporary European cathedrals. It thus remains as an outstanding example of original Gothic architecture. The square in which it stands, bounded on the opposite side by the palace of the Venetian Providitore, had once the reputation of being the largest in the Western world. Famagusta, too, is the 'seaport in Cyprus' of Shakespeare's Othello: there is little doubt that the governor of the city in 1508, Christoforo Moro, is identifiable with Shakespeare's Moor. Due to this link, the citadel of old Famagusta, which bears the winged lion of Venice above its main entrance, is now known as 'Othello's Tower'. The new town of Varosha presents a complete contrast: it contains all the buildings of commercial and administrative importance, the night-clubs and the luxury hotels. It is jointly to these hotels-fronting directly on to one of the best beaches of the island-and to the port that Famagusta owes its present prosperity. The port itself lies immediately under the Venetian defences of the old town. It is from here that most of the agricultural produce of the Mesaoria is exported, and into where the greater part of the island's imports are directed. If, then, the tourist area and the sea-front could be in any Mediterranean coastal resort (albeit cleaner than many), and if the port could equally well be anywhere else in the world, the residential sectors of the town are perhaps unique. For here the orange groves on the rich and formerly well-watered soils of the outlying areas intermingle with the villas, not only providing most of the inhabitants with their own supply of fresh fruit,but also serving to perfume the whole town with the distinctive sweet scent of orange blossom. 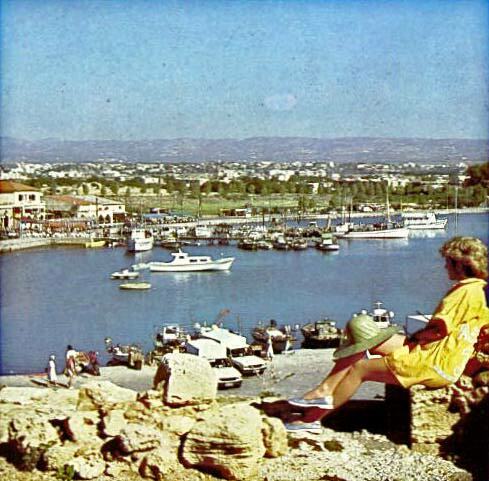 Kyrenia was the most picturesque of all the Cypriot towns up until July 1974 when its inhabitants were forced out, once best known to the English community and unjustly famed as the favored place of retirement of ex-colonial administrators. The town was founded by Achaean colonists in the tenth century BC, later to become a full city state. But it was not of great importance in the overall political structure of the island until it was fortified by Byzantium. The castle, which dates from this time, was strengthened and enlarged by the succeeding Lusignan and Venetian rulers. It was used again as a place of imprisonment during the EOKA movement of the 1950s, although even then prisoners succeeded in escaping by the simple expedient of climbing down on knotted sheets. Despite having a history longer than any of the other five towns, Kyrenia was the only one that did not act as a market centre for the region, since its position a such is usurped by the neighboring twin villages of Lapithos and Karavas, and by Nicosia which is only 15 miles distant on the direct road. It has, then, become first and foremost a holiday resort, centering on the little yachting and fishing harbor. 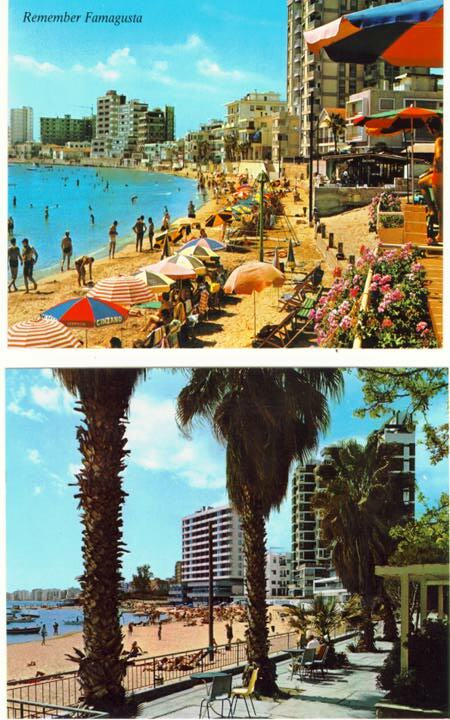 Although accommodating only 5,000 inhabitants in 1970, it looked set for growth also as a commuter village to serve Nicosia but the dream disappeared after the Turkish troops invaded the island. Salamis, the main city of ancient Cyprus, was situated on the east coast near the modern city of Famagusta. An important port said to have been founded by Ajax's half-brother Teucer after the Trojan War, it was the scene of a Greek naval victory over Egypt in 306 BC. Badly damaged in the Jewish revolt of AD 116-17, Salamis was rebuilt by the Roman emperor Constantius II after an earthquake in the 4th century and was finally destroyed by the Arabs in 647.